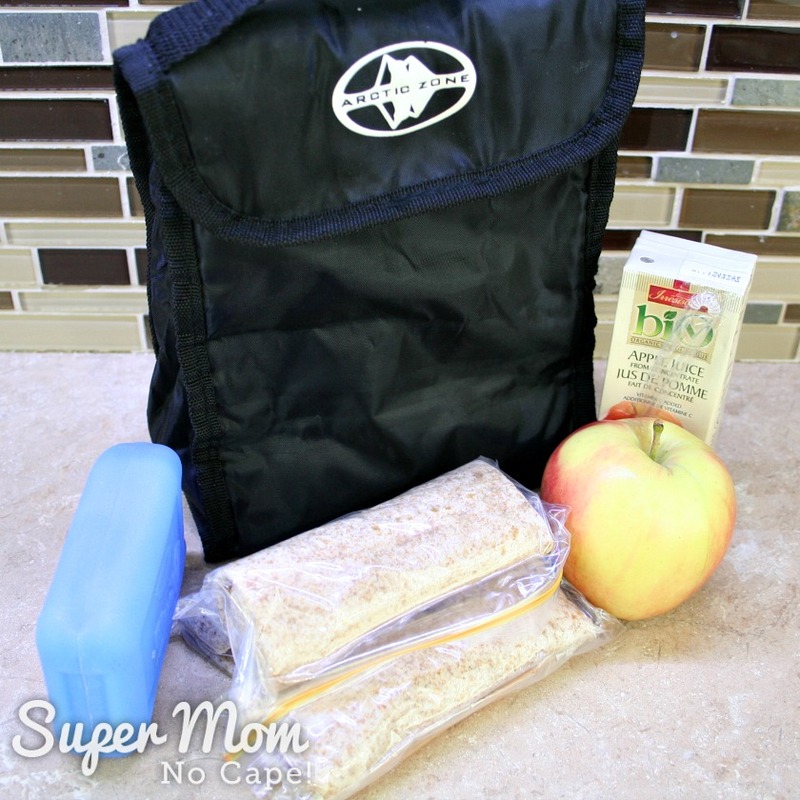 Getting yourself and your family out the door on time each morning can be a challenge. Add in getting everyone to eat a healthy breakfast as well and that’s a stress you just don’t need. 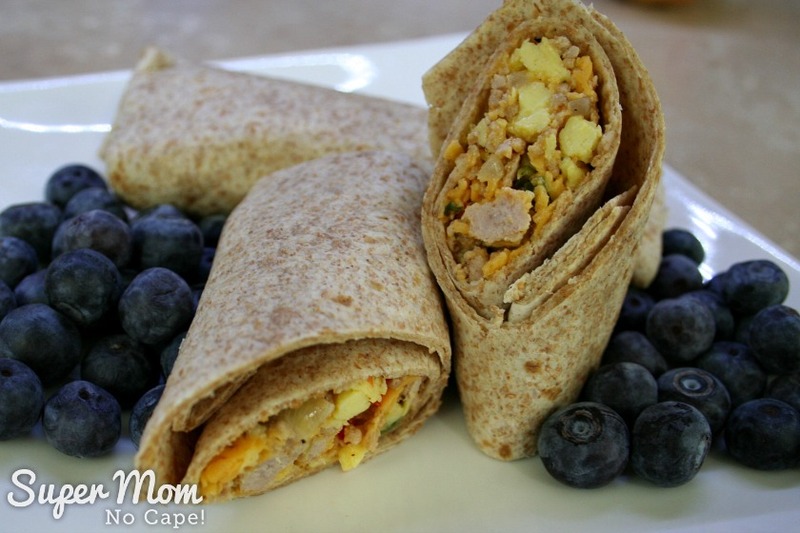 Breakfast Burritos are an easy make-ahead meal you can have ready in the freezer for those mornings when you need to grab and go. 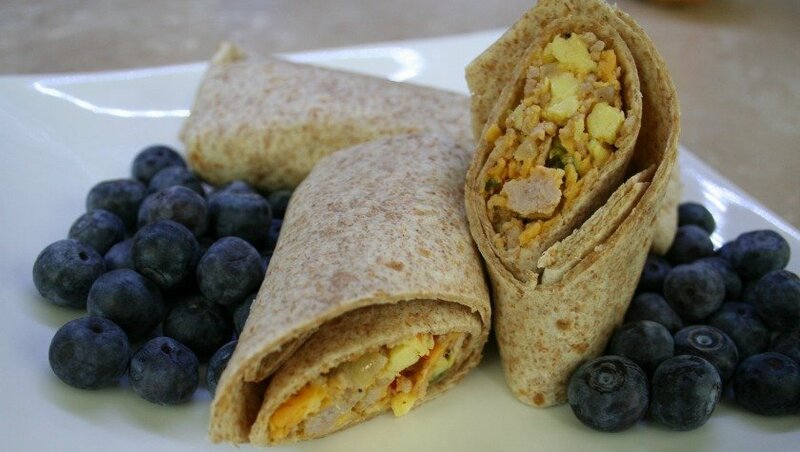 Taking a bit of time on the weekend or a week night to prepare and freeze these homemade breakfast burritos can make the difference to getting your family where they need to be each morning not only on time but knowing they’ve had a nutritious breakfast that will power their bodies until lunch. 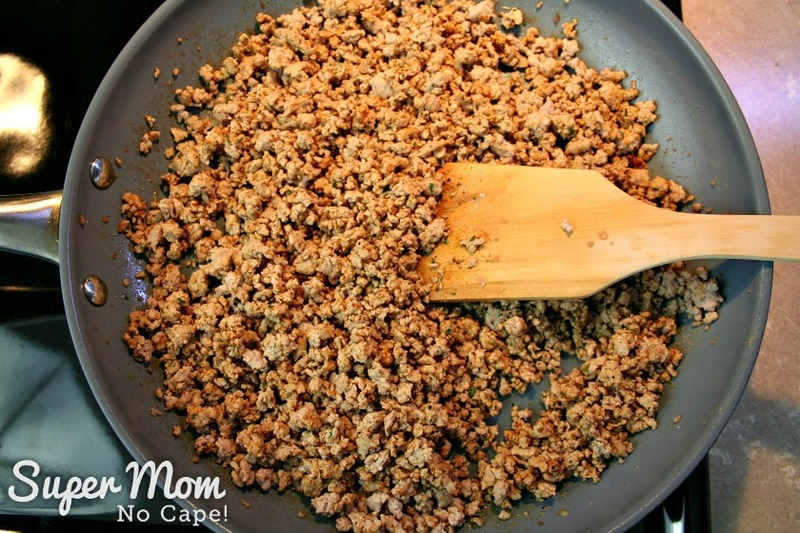 2 cups of grated cheddar cheeseNote: If there’s a favorite breakfast sausage meat that you really like, feel free to substitute that for the ground pork and spices. 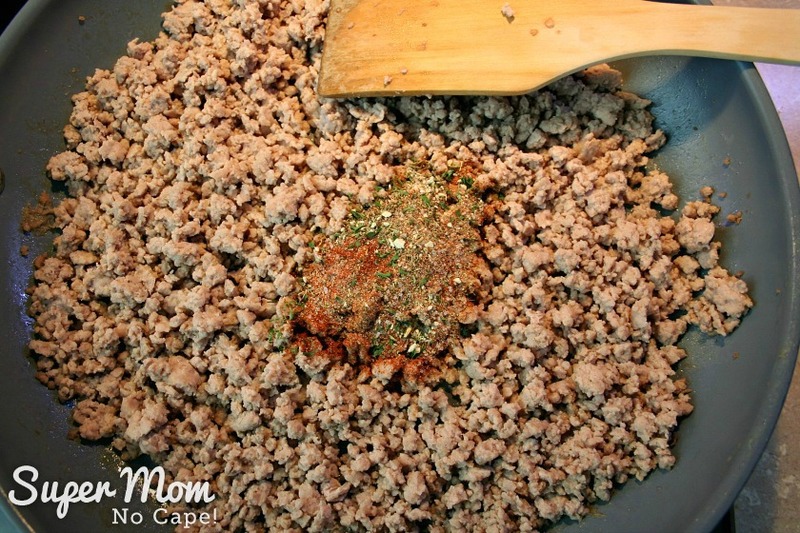 I used to use that until I couldn’t get our favorite sausage meat anymore and decided to make our own and we discovered we liked this version better.You can also add in things like sliced mushrooms. Or if someone in your family doesn’t like onions or peppers or is allergic to them, leave them out.Do a bit of experimenting to discover what your family likes best. 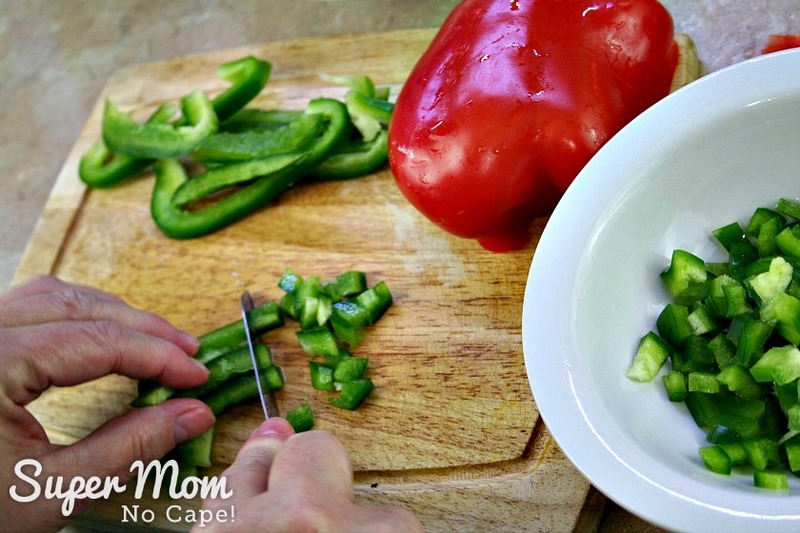 Chop the green and red peppers. 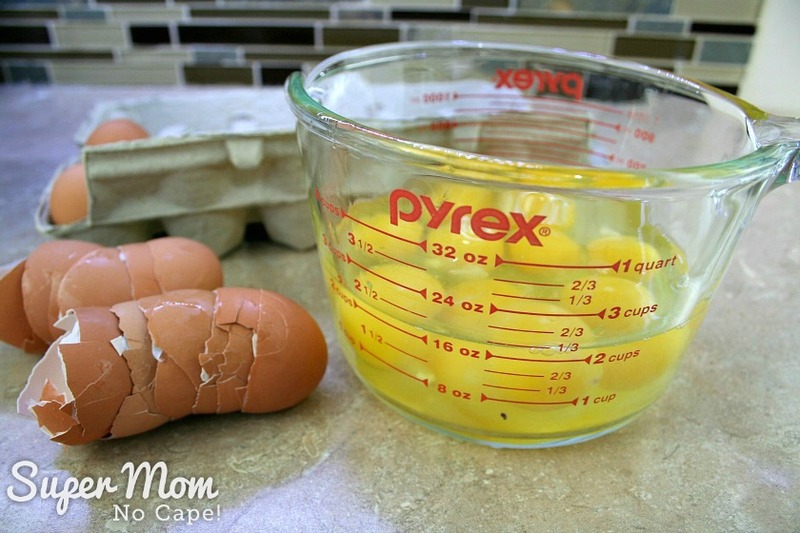 Crack eggs into a measuring cup (<-affiliate link) until you have 2 cups of eggs. Beat well to combine yolks and whites. 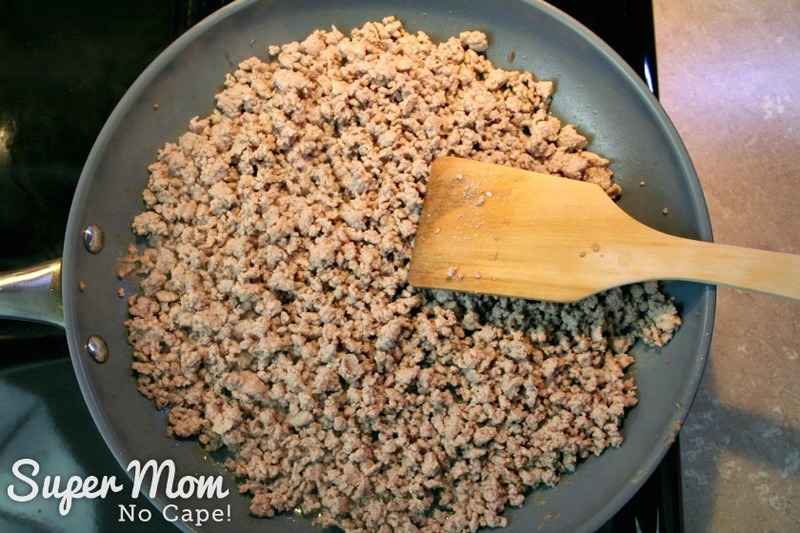 Scramble fry the ground pork, breaking the meat up into small pieces as it cooks. 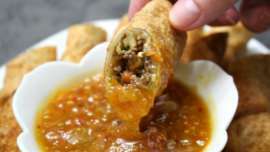 Continue to fry the meat mixture until it is thoroughly cooked then transfer it to a large mixing bowl. 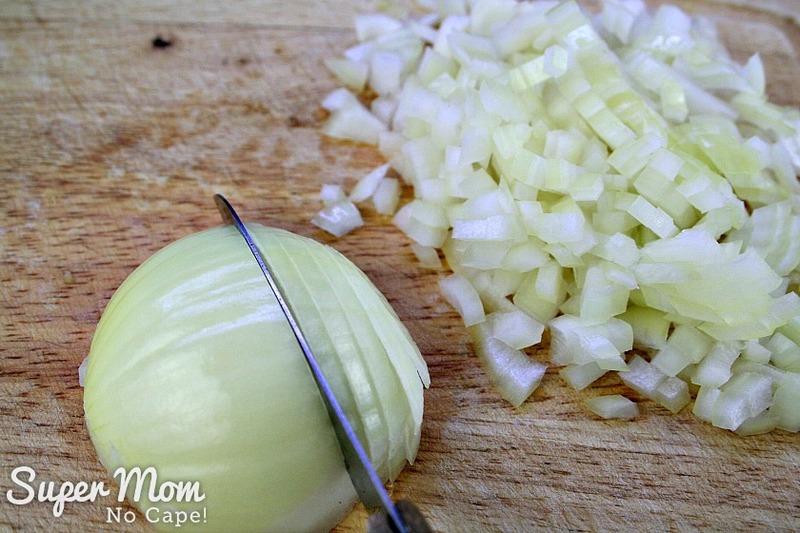 In the same pan, sauté the chopped onions and peppers until the onions are translucent. 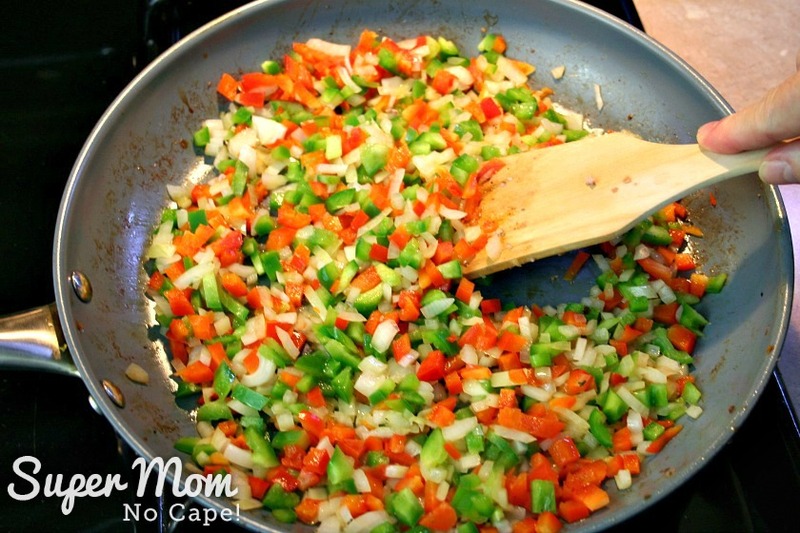 Add the fried onions and peppers to the bowl with the meat mixture. Turn the burner down to medium low. 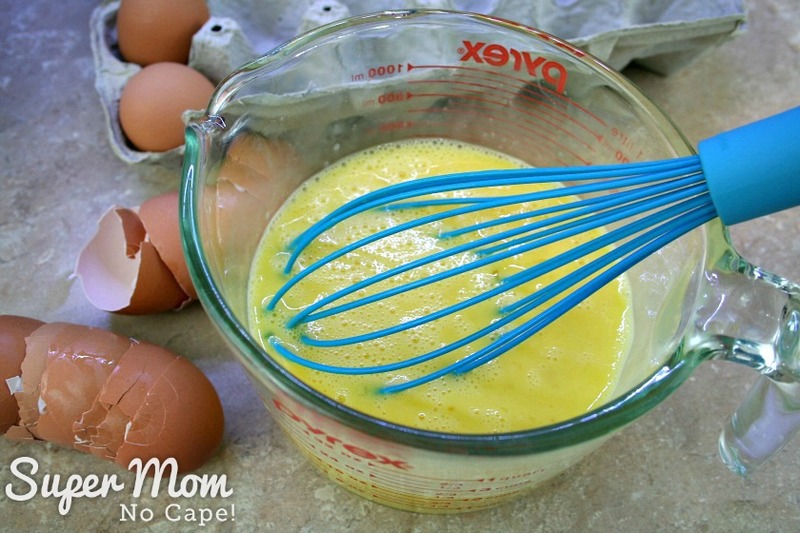 Pour the beaten eggs into the pan… no need to clean it. This will take a few minutes but hurrying the process by trying to fry the eggs on a higher heat will result in tough, rubbery eggs. 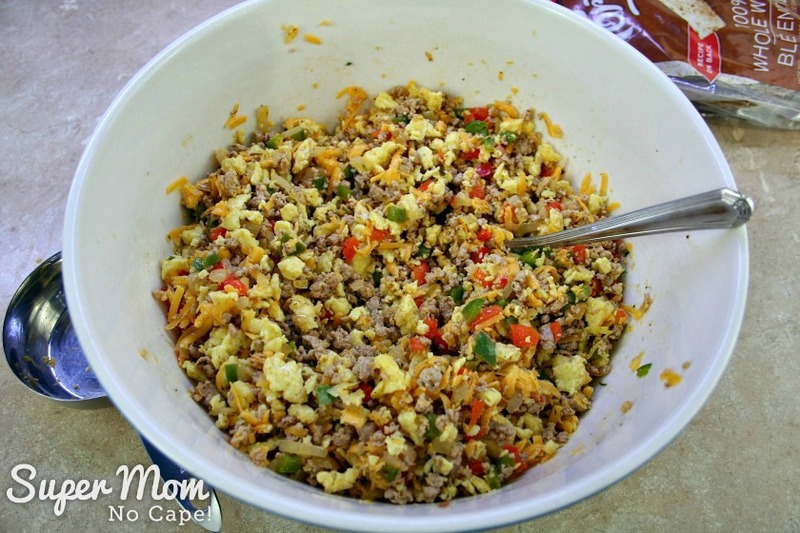 Add the eggs to the bowl with the meat mixture and onions and peppers. Allow this mixture to cool for at least half an hour. You want it cool enough so that when you add the cheese it doesn’t melt into a big glob. 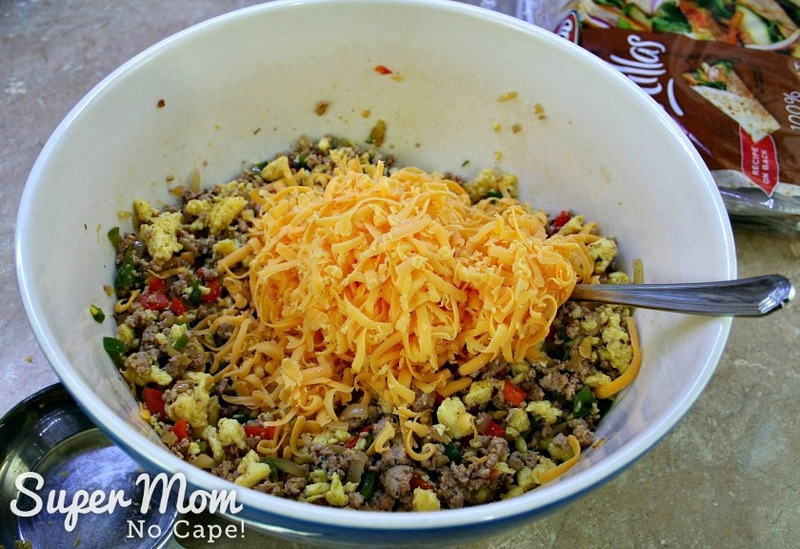 Once the eggs and meat mixture have cooled, add the grated cheddar cheese. 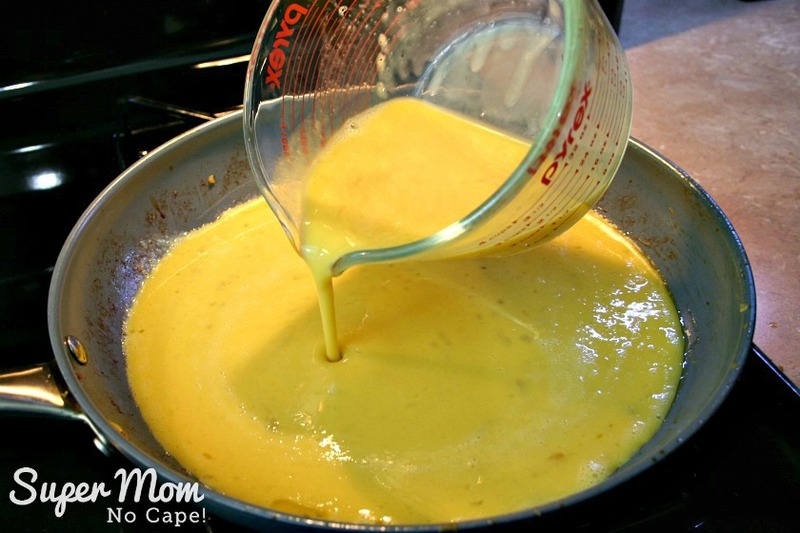 Scoop egg, meat and cheese mixture on to a tortilla. I use a 1/3 cup measure. But you can add more or less if you like. 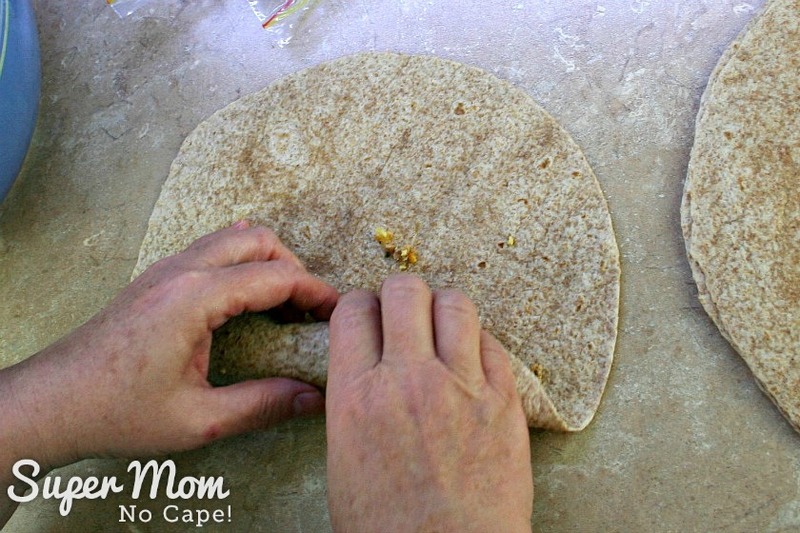 Just be careful not to add too much or you won’t be able to roll the tortilla around the mixture to form the burrito. 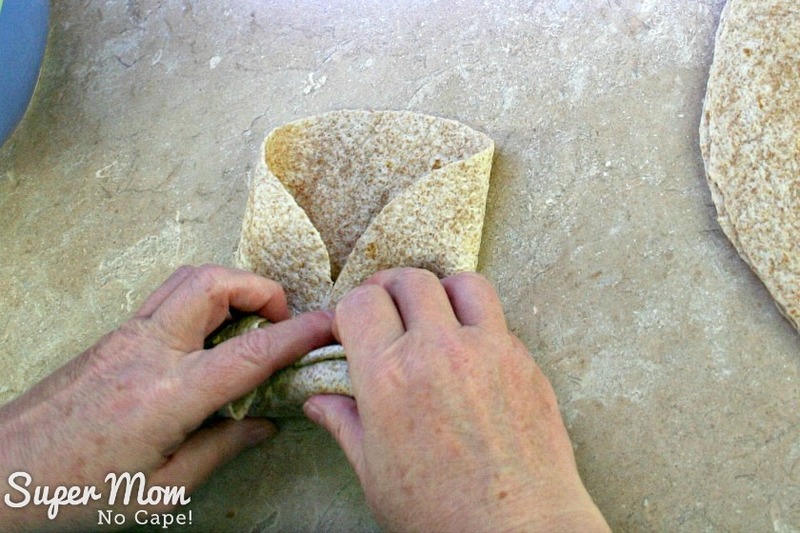 Fold the end closest to you over the filling. Here’s another view of what that will look like. 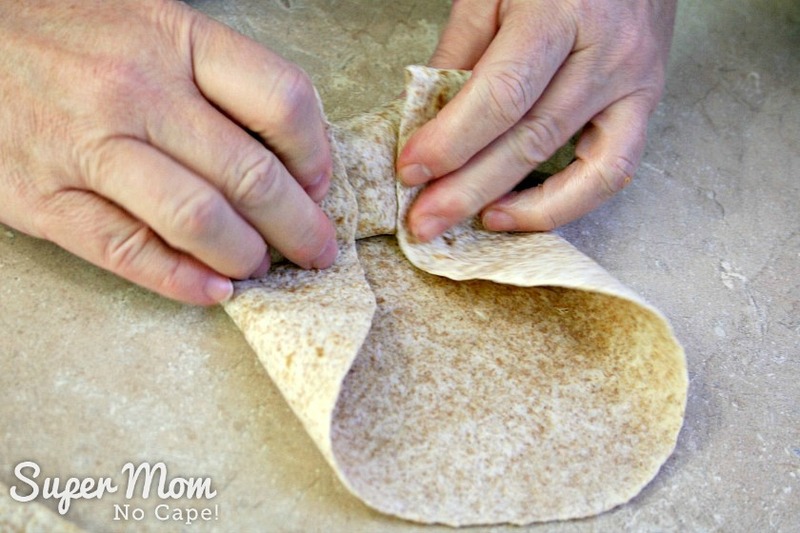 Fold in the second side. 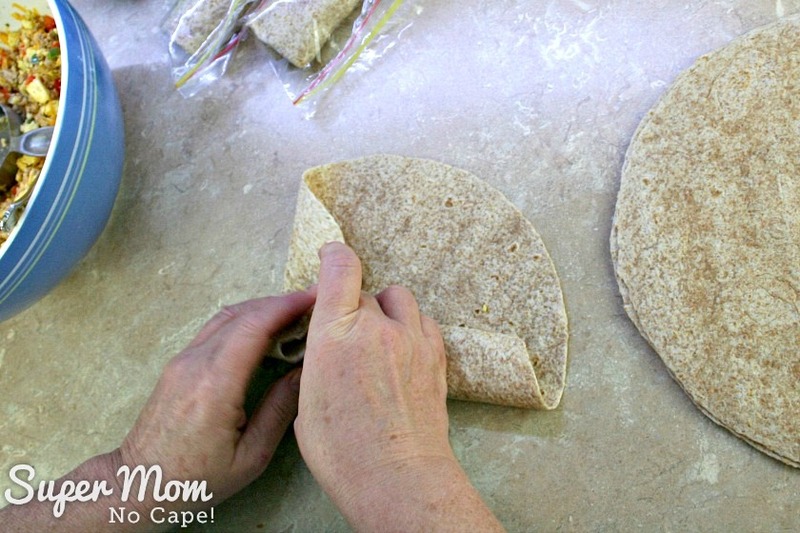 Roll the tortilla to form the breakfast burrito. 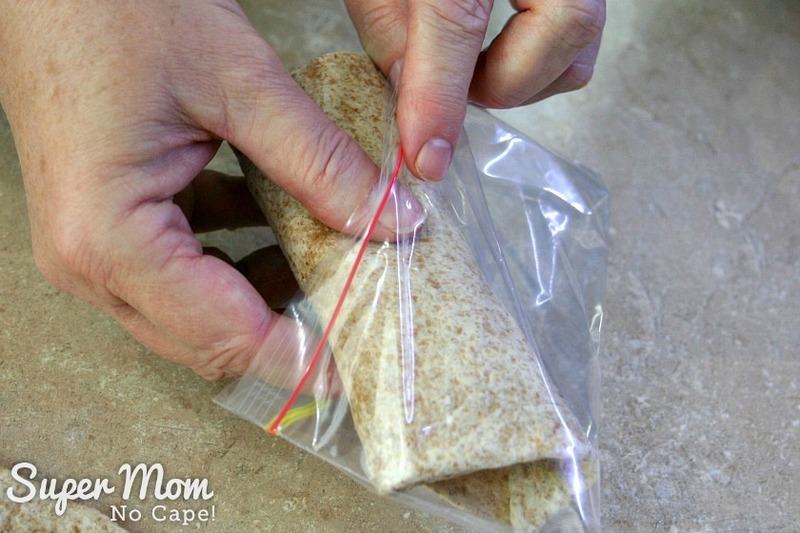 Place the burrito inside small zip bags. It should fit perfectly into the snack size zip bags . 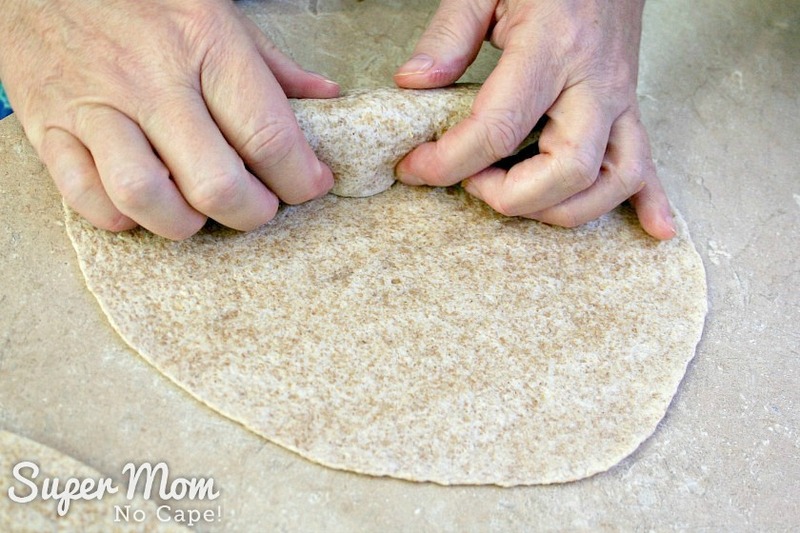 Continue to make burritos until you run out of filling or tortillas, whichever comes first. 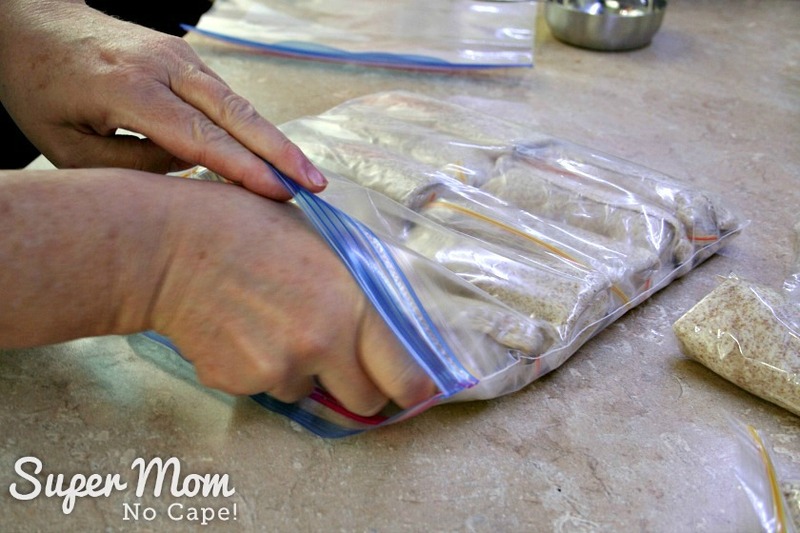 Place finished burritos into a large one gallon plastic zip bag. Freeze for up to 3 months. 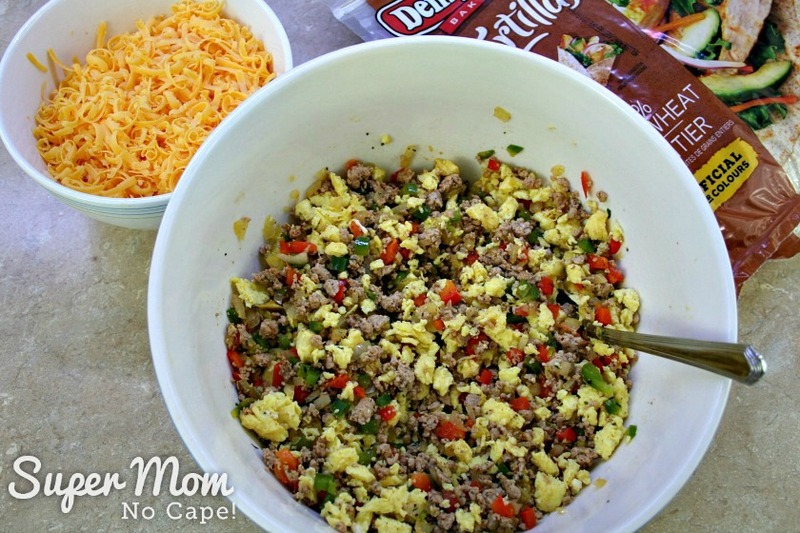 But if your family loves them as much as ours, you’ll be making another batch of these freeze ahead breakfast burritos long before that. 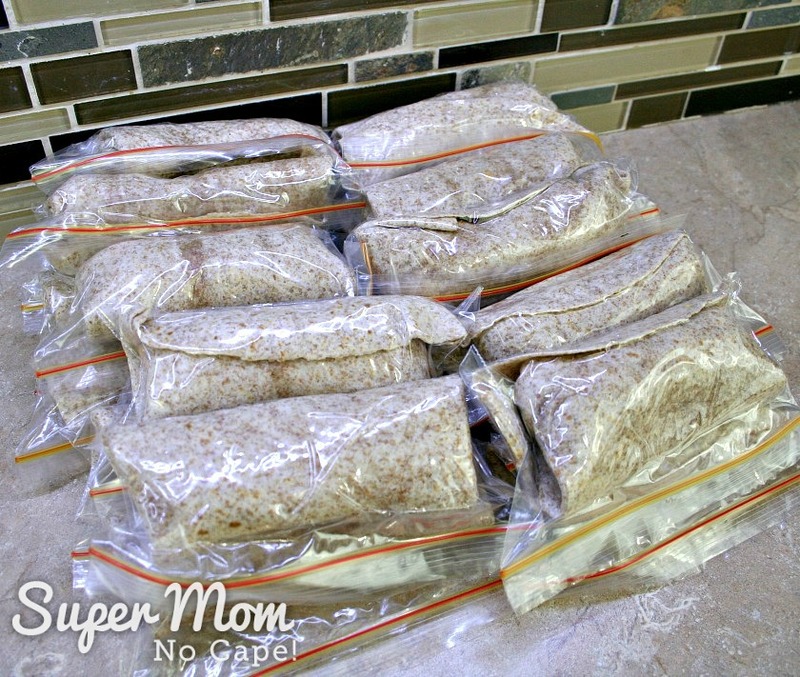 2 packages of tortillas should get you 2 one gallon freezer bags of Homemade Breakfast Burritos to make those on the go mornings flow more smoothly. To reheat: Microwave one burrito on high for 1 to 1 ½ minutes. If cooking more than one, adjust the time. Each microwave is different so you may need to experiment to find which timing works best. 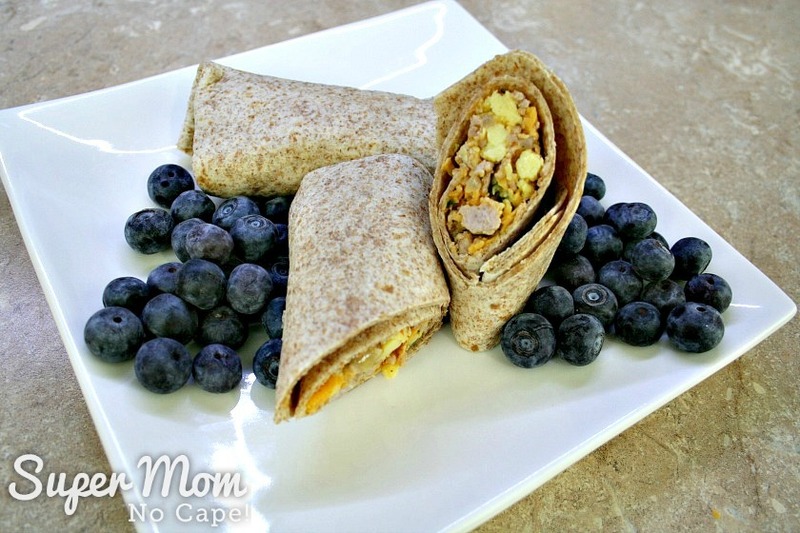 Serve them with some fresh blueberries or your favorite fruit. 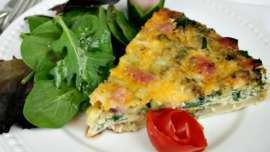 One or two of these for breakfast will definitely keep your family going until lunch time. Speaking of which, they’re also great to add to lunches. 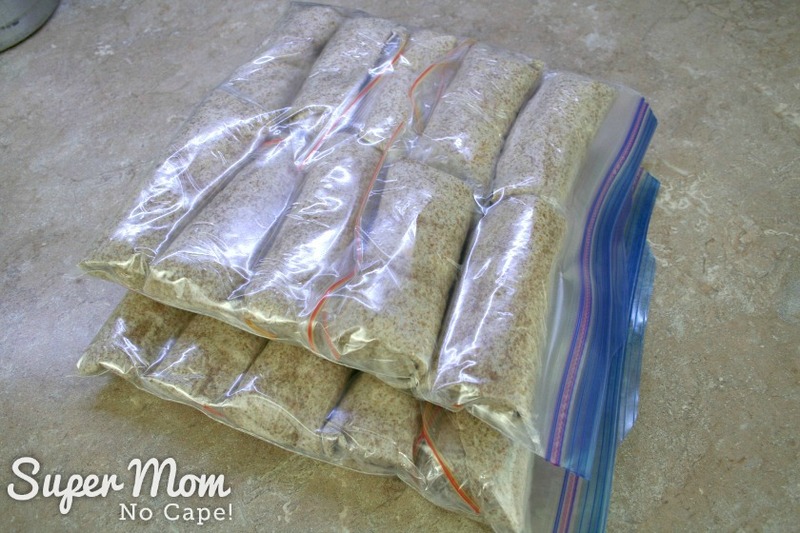 Pop them into the lunch bag still frozen and they’ll be thawed and ready to eat by lunch time. Another great make ahead and freeze meal to add some variety to your morning are these homemade breakfast muffins. 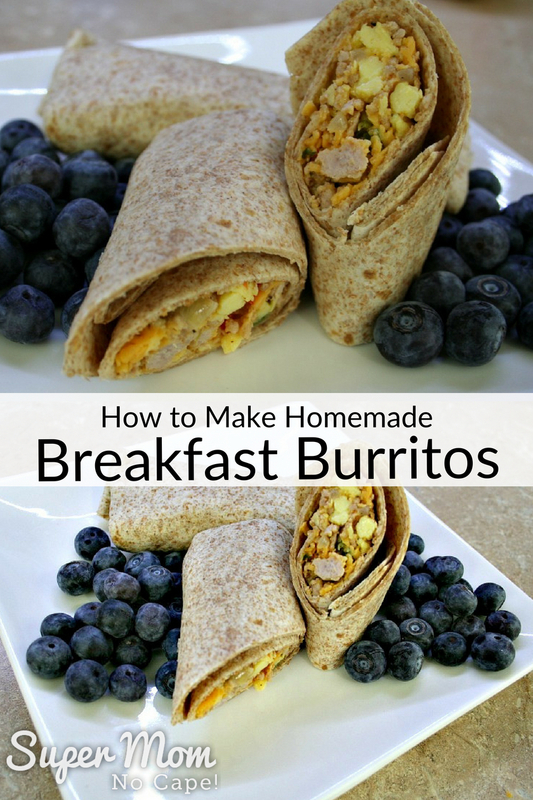 Be sure to save the recipes for Homemade Breakfast Burritos for future reference by clicking on the Pinterest button underneath this post. 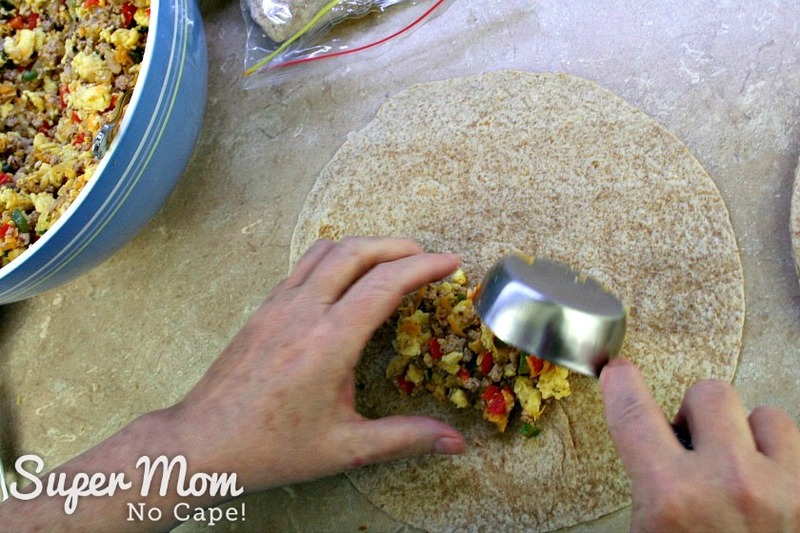 Note: How to Make Delicious Homemade Breakfast Burritos was originally published on Super Mom – No Cape Feb, 2012. 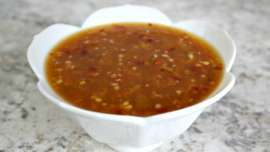 It has been completely updated with new photos and recipe instructions. YUMMY – these would be great for an after-work snack too! That hour between getting home from work and supper being ready is apparently an hour too long for my kids to wait to eat, LOL! Thanks Super Mom. You aremakingMYkids think I am a Super Mum! love these even more, great start for school days to keep the going ! I cook the sausage 1st with the onions then cool. 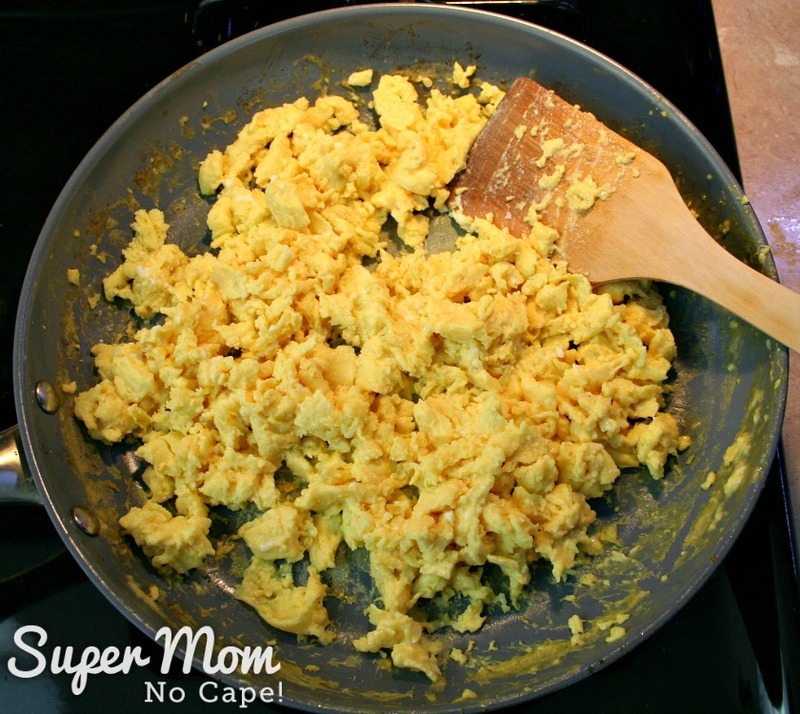 Add to scrambled mix and bake the eggs in 8×8 glass pan – then I cut rectangles which are much easier to roll in the tortillas. That’s an intriguing idea. Sounds delicious!